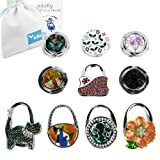 kilofly Foldable Purse Hooks keep your bag from the dirty floor and thieves by hanging it right next to you on the table. These fancy purse hooks not only give you a peace of mind, but they also make fabulous adornments with your purses. These Foldable Purse Hooks are very durable and are designed to support heavy bags. This pack includes 10 pieces in different designs as shown in the images.